WHEN HAS BEING AN ENABLER EVER SOLVED A PROBLEM? You can lead a horse to water but you can’t make him drink. I fear for the survival of the USA as a free nation. There are only two means of discipline to maintain and keep a peacefully and orderly society. Number one that has been used almost solely throughout all of history, which is known as the “Iron fist.” Almost all authoritarian types of government use the "Iron fist" and permit very little individual freedom, period. And number two is the only means of discipline that will allow a great amount of individual freedom, which is a true free market place economy minus any kind of federal minimum wage law. Sure, any state, city, local, or private enterprise minimum wage law is a good thing, but a federal minimum wage law is a monopoly, which is a bad thing. And I can guarantee you now the USA will be in the “Iron fist” category in just a few more years. 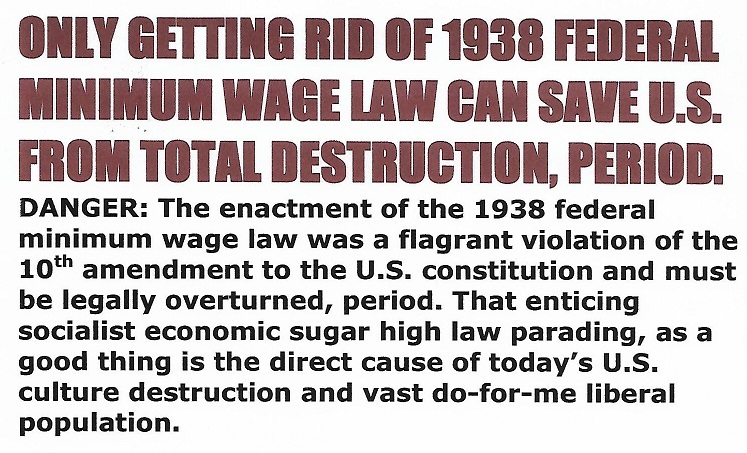 The reason that is definite going to happen is because the USA will never repeal the 1938 federal minimum wage law. A federal minimum wage law block and kills the purging power discipline in a true free market place economy, period. That is why the USA has so many liberals today being produce because there is not enough strong societal discipline in the USA society anymore. Purging power using the bust cycle is what purges out all survival threats by keeping them from growing too large and powerful, which is always a threat to the rich. As to the law: you know what they say about putting locks on things, locks only deter good people with good morals. And the same can be applied to the law, the law only deters people who respects or fears the law, which means the law without strong sure discipline teeth enforcing it just breeds more liberalism until chaos destroys all individual freedom.